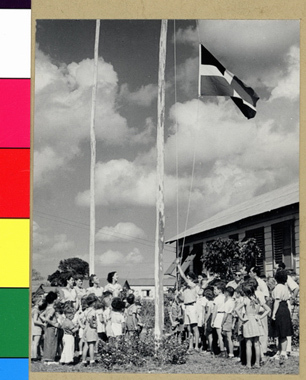 JDC - Archives : The raising of the flag of the Dominican Republic at the Christobal Colon (Christopher Columbus) school. Title The raising of the flag of the Dominican Republic at the Christobal Colon (Christopher Columbus) school. Description Students gather for the raising of the flag of the Dominican Republic at the Christobal Colon (Christopher Columbus) school in the Sosua refugee settlement.